For the first three days of this trip we found ourselves following a fairly set routine. We’d get up and be on the road in good time, have a fairly lengthy morning driving and sight-seeing, eat a large late lunch, visit another site, drive on to our motel, and finish the day with some snacks in our room whilst checking email, reading and watching Food Network. Today, however, we only had one attraction on the itinerary, our final destination was a mere 46 miles away, and for the first time we were going to be staying in a town we actually wanted to visit instead of it being simply a convenient place to break the journey. 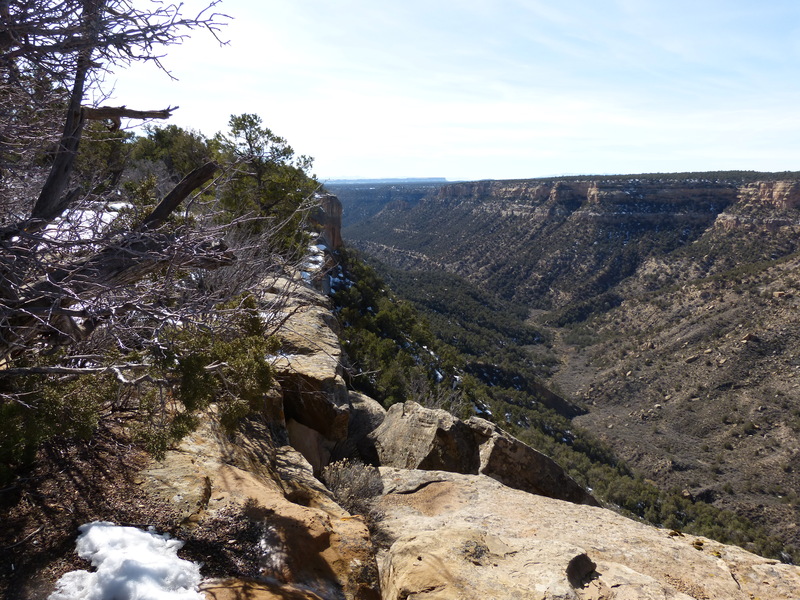 In the end, it was just as well that we hadn’t made any plans for the afternoon, as our visit to the Mesa Verde National Park took a lot longer than we had anticipated. I think we still find the inclusion of ‘national park’ in the title a little deceptive, perhaps it makes us think of much smaller parks (Hyde Park perhaps, or even Central Park), when really we should be mentally equating it with something like the Peak District (which I have just realised also has National Park in its full title). 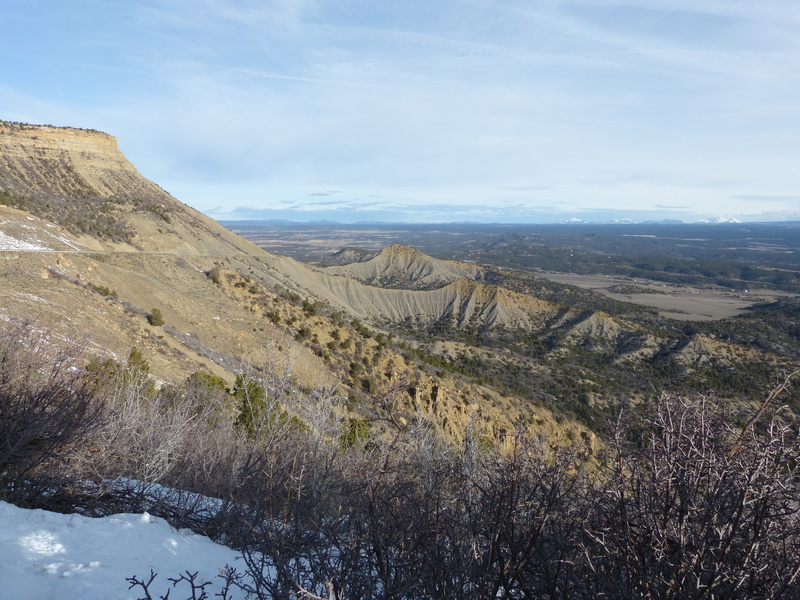 Anyway, once inside the park, you have to drive around 20 miles along steeply winding mountain roads to get to the first of the interesting sites (although plenty of viewpoints are provided along the way, should you wish to pause and admire the dramatic scenery). Then once you’ve finished exploring that part of the park, there is an additional six mile loop which takes in a further selection of interesting sites. And that’s just the winter offering – judging from the map there’s about twice as much to see (and almost twice as much driving to be done) during the summer months. All that notwithstanding we had a great time. It was a beautiful day – cold, clear and sunny – and there were hardly any other visitors in the park. 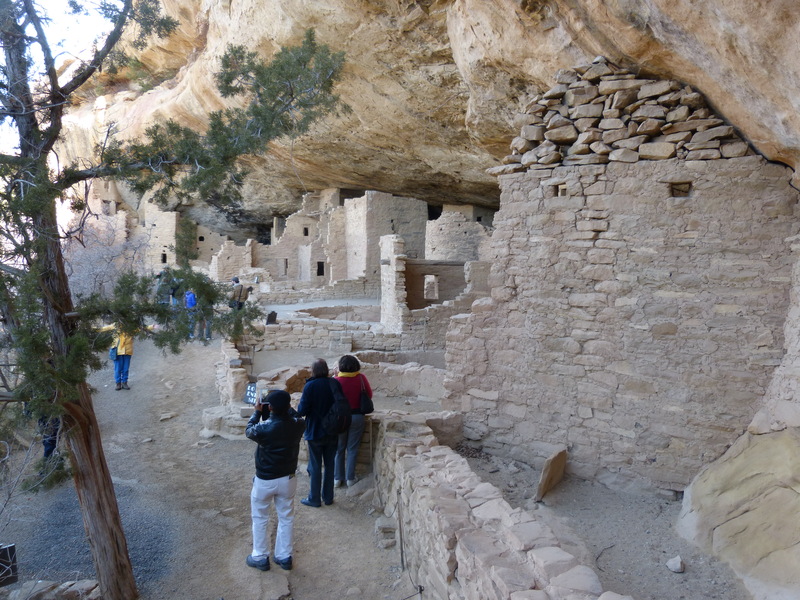 We started at the archaeological museum, where we learned that human presence in that area dates back to around 1AD, before joining a ranger-led tour down to one of the cliff-dwelling sites. These structures were really remarkable, and also quite mysterious. 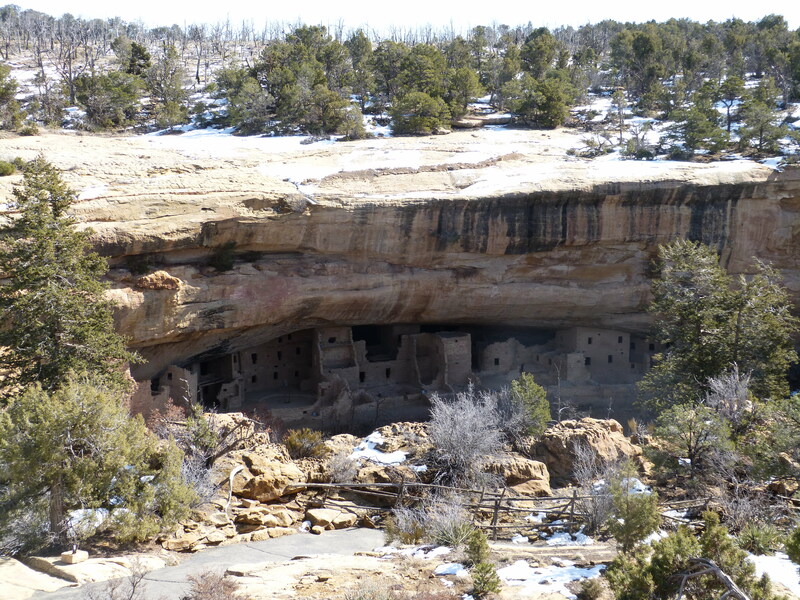 From our enthusiastic and informative guide we learned that most of the settlements (from around 600AD onwards) had been situated on the top of the mesa, which was also where they cultivated their staple crops of corn, squash and beans. Initially living in pit houses (which were quite literally a hole in the ground supplemented with small walls and a roof), they began constructing increasingly sophisticated buildings from around 900AD onwards. Somewhere around 1200 they moved beneath the overhanging clifftops, where they continued building multi-roomed connected homes until around 1270, and by 1300 they seem to have moved on from the area altogether. There doesn’t seem to be any archaeological reason for the mass exodus – no evidence of war or disease, and whilst there was a significant drought at that time they had weathered such events before (and their route apparently took them further out into the desert, so it seems unlikely that lack of water was their prime motivator). 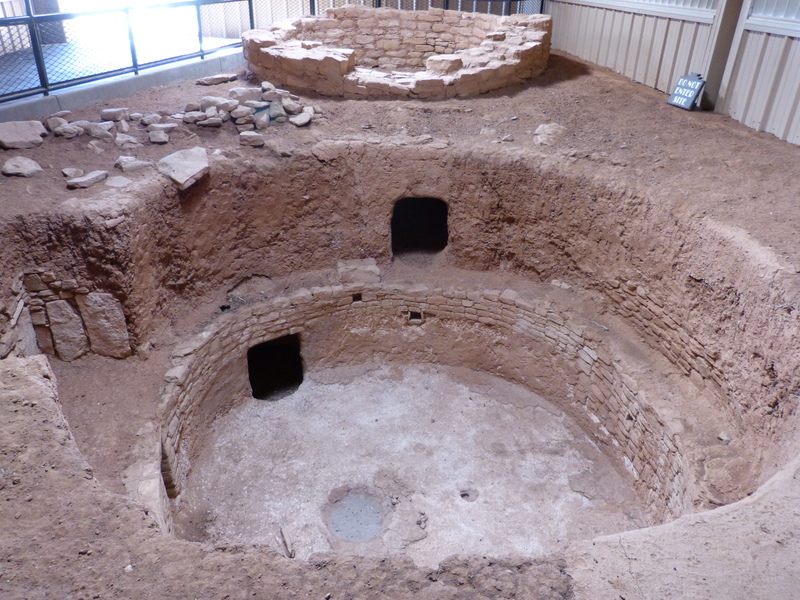 In addition to structures for living in, the pueblo people also constructed kivas – round roofed structures for communal gathering, with a strong spiritual significance. Initially very similar to the pit houses, these morphed into subterranean rooms (even when the main buildings were above ground). 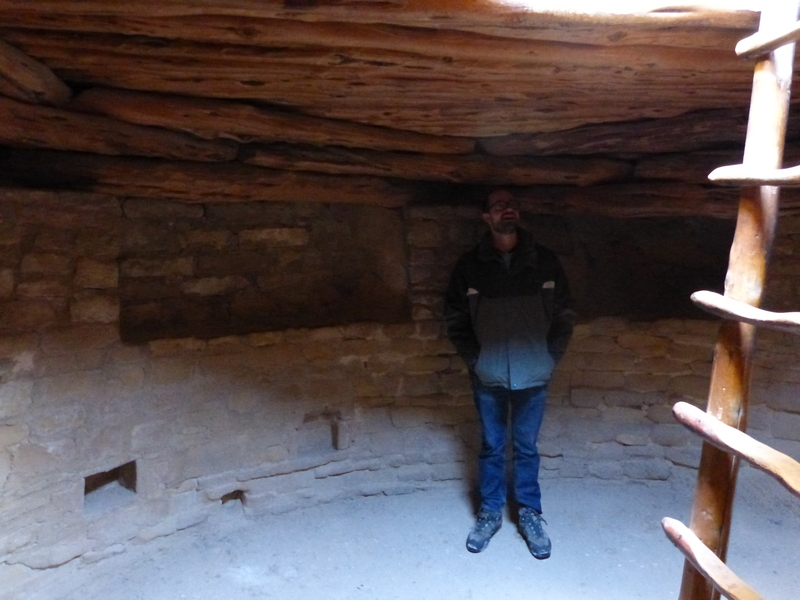 Each extended family seems to have had their own kiva, and they all shared common features – a firepit beneath the entrance hole which doubled as a chimney, a ventilation shaft with deflection stone to prevent draughts, seating around the edge, and a small hole called the sipapu which represented the hole in the earth from which they believed humanity had emerged. After a very pleasant picnic lunch in the sunshine (we were the only people in the picnic area), we drove around the mesa top loop, stopping to visit sites at which these various phases of architecture are preserved. All of this was surprisingly tiring (the effect of that fresh mountain air, or perhaps it was the altitude – we spent most of the day at around 7000 feet), so it was just as well that the drive to day’s end in Durango took less than an hour. 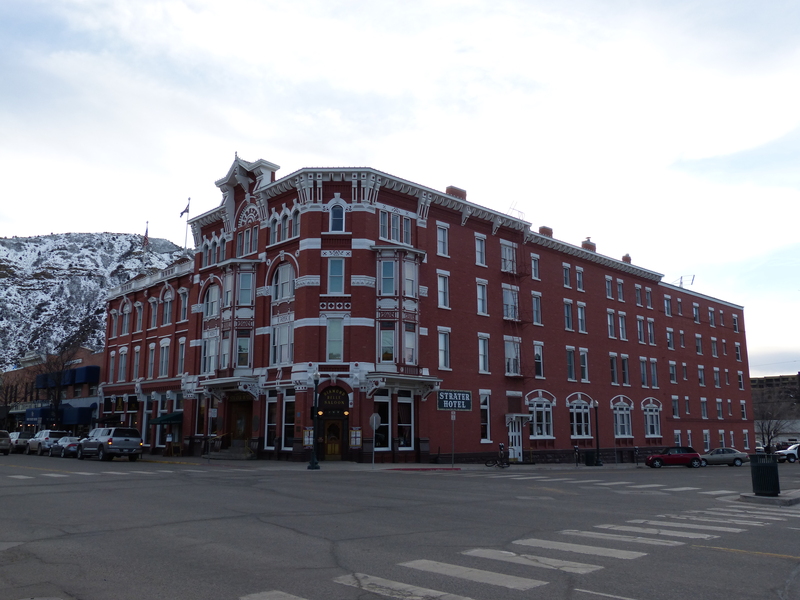 Durango is an old mining town, and our bed for the night was at the historic Strater Hotel. 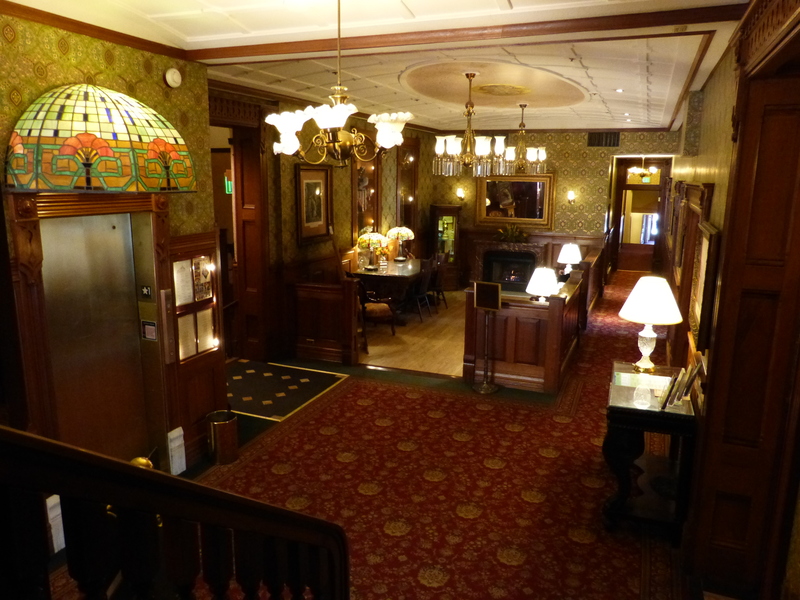 Dating back to 1887, the Strater is a lovely old building with a wealth of original features, which we admired briefly before heading out for a quick wander along the town’s main street. A location for dinner duly selected, and some sight-seeing options scouted out, we returned to one of the hotel bars to take advantage of the end of happy hour. 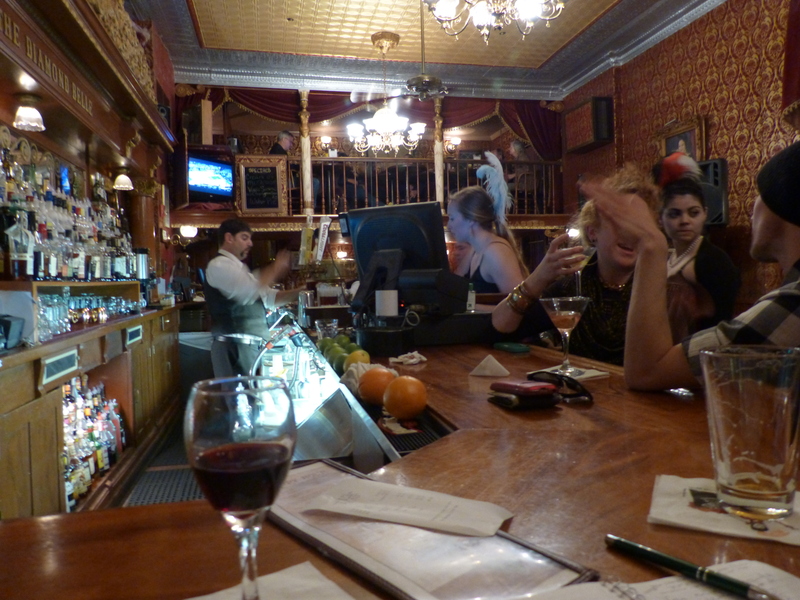 This entry was posted in Exploring, Holidays, Travel and tagged driving, Four Corners, pueblos by Emma Davidson. Bookmark the permalink.